At universities all over the world there’s been a revolution in alumni relations. No longer can graduates just expect a quarterly newsletter and an annual fundraising phone call. Universities around the world are thinking innovatively, mobilising their alumni and winning hearts and minds, as a university’s past takes on a bigger role in shaping its future. To inspire your next alumni communications strategy and give you some interesting new ideas, we’ve delved into our Lab and put together a quick global round up of the most innovative and interesting promotional activity out there. The ‘Inspire Innovation’ campaign from Carnegie Mellon University is a good place to start as it shows just what can be achieved. It’s an impressive example of how to connect with 50,000 alumni, faculty, parents, staff, students and friends while tripling the number of volunteers and raising over $1 billion in the process. This four-year campaign has just finished and you can join in the celebrations at their thank you website. Colombia University in New York also take alumni donations seriously, helping to provide vital scholarships for students. Their Giving Day in 2012 raised an incredible $6.8 million in just 24 hours. Watch the video and discover why the idea deserved a CASE Circle of Excellence Award. Other campaigns of note include the interesting and ambitious fuelinginnovation campaign at the Illinois Institute of Technology. Their video is impressive and their alumni can even fuel the campaign themselves by adding their story to the global map. The University of Sydney are also rightfully proud of their award-winning ‘Ignite the possible’ initiative that managed to engage with communities and attract both funding and postgraduates. Moving back to the US the ‘Thanks to Berkeley’ campaign has achieved standout through their innovative photobooth project. They certainly aren’t resting on their laureates! Photography is a big theme in the UK too with UCL’s ‘Global Student Engagement and Philanthropy Day’. Themed ‘What would Jeremy do?’ students and alumni were encouraged to donate gifts of £3 to £3m and have their photo taken in a pop-up Jeremy Bentham (the University’s spiritual father) photobooth. Meanwhile Drexel University must take a bow as they recently won a CASE Award for their alumni relations programme that celebrated the Year of the Dragon with a different alumni event each month. They kept their engagement fresh 365 days a year through such events as ‘ask the alumni’ and a scavenger hunt. Many universities such as the University of Nottingham are now not just asking for funding, they are enabling alumni to choose which areas of the University their funding should be spent in. While the University of Connecticut have gone one step further, turning fundraising into crowdfunding so their alumni can support the aspects of university life they are most passionate about. In fact, the whole fundraising part of university life is now spawning new businesses with SoFi a new start-up that has been created to attract funds from alumni for student loans with a fixed rate of 5.99%. Beyond funding Harvard are now asking their alumni for more than just money – they are asking for their time and intellects to enhance the online learning experience. Meeting the needs of 27,000 students on a MOOC course ‘The Greek Hero’ is a big challenge – which is why Professor Gregory Nagy called for alumni reinforcements and asked for volunteer heroes to assist with mentorship and online forums. One part of fundraising that should never be forgotten is saying – “Thanks”. At Villanova University, they make sure everybody appreciates the importance of donations by showing people where it makes a difference. Their ‘tag days’ highlight what areas of the campus benefit while people have fun taking part in their QR Code Tag game. Networks such as LinkedIn highlight the power and potential of professional connections like never before. So many institutions such as HKUST Business School are upping their game and creating an ‘alumination’. While others are attracting large followings on Facebook with the Indiana University Alumni Association page attracting nearly 17,000 likes. The same University also goes to great lengths to help their volunteer leaders attract more alumni with their ‘programs in a box’ and ‘watch parties’. And as with anything in life there’s an app for that too. Talking of apps, you’ll find a range of alumni apps on iTunes that cover everything from magazines and news updates to conventions and ways to connect and stay in touch with fellow graduates. Sometimes the simple ideas are the best. To bring alumni and current students together, the SOAS University of London connects students with mentors over a coffee, either virtually or face-to-face. While at Johns Hopkins University they run Bridge5 ‘an ongoing community connecting incoming freshmen with alumni five years ahead of them’. Some universities are going further still by providing invaluable insight to their graduates to keep on inspiring them and continue the learning experience long beyond graduation. Check out the Open University Business School’s free Business Perspectives series. It’s open to all. And if you haven’t yet seen our blog piece ‘More Social Sparks’ there has been some great social interaction going on with alumni at US universities competing in the Alumpics. We can’t wait for 2016! And continuing the sports theme, Hobart and William Smiths Colleges went head-to-head to raise funds with a ‘knockout’ idea. Whatever way you look at it, alumni are great ambassadors and have an increasingly important role to play in the future of universities. They are even helping international students to adapt to the local culture. 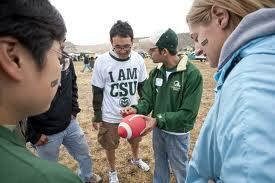 Football 101 at Colorado State University is a two-day event that helps new students get to grips with US football. And even alumni dogs are proud to play their part, showing their support as ‘Mizzou Mutts’. In the world of alumni relations there is some great stuff going on. But as this excellent article in the Guardian states there are still many more alumni opportunities out there! Finally, let’s not forget the power of user-generated alumni communications in promoting an institution to potential students. There are numerous formal, well managed channels that do this. There are also the informal, often independent, channels – providing the authentic take on higher education life. Check out the ’41 signs that you went to the University of Kentucky’ blog – we think it gives some credible, and interesting, insight, but make your own minds up. To find out much more about The Future Index, the marketing comms inspiration we are collecting and how it could be of use to you, please have a quick look at our main site. Or check out some of our other posts on the higher education marketing communications world – from billboards in Peru to a tour of 80 apps around the world. And lots more of these social media sparks. Just click here.